William Mark "Bill" Sackett, Stephen E Sackett and Warren Ayer. US Social Security Administration, "Social Security Death Index", database, American Ancestors, "Celinda Sackett, b. Jan 18, 1896, d. May, 1982, SSN 057-52-2879 issued NY, residence Endicott, New York, 13760, county Broome." Sackett, Hermon, son, b. Jun 1890, 9, b. PA, father b. PA, mother b. WV. Sackett, Hermann E, son, 18, b. PA, father b. PA, mother b. WV. "US, World War I draft registrations records 1917–1918", digital image, Ancestry.com, Pennsylvania, Susquehanna. Roll 1926739. "No 1211/54, Herman Eugene Sackett, age 25, of Hallstead, PA, b. 19 Jun 1891, natural-born citizen, b. Scranton, Pa, tender repairer, Erie RR Co, at Susquehanna, dependents wife, married, Caucasian, previous military service Private Cavalry, 2 yrs, Nebraska. Registrant tall ht, slender build, light blue eyes, brown hair, not bald, no disabilities. Reg Hallstead, Pennsylvania, 5 Jun 1917." 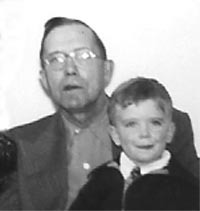 Sackett, Samuel, son, 6/12, b. NY, father b. PA, mother b. PA.
Sackett, Lois, dau, 11/12, b. NY, father b. PA, mother b. PA.